Gladwell is ranked as one of the highest-paid speakers in America today, who pulls in up to $80,000 per speaking gig—or about $1 million a year, according to Fast Company. For comparison: Mitt Romney only made $500,000 in speaking fees in 2010. "Have I given paid speeches to companies or industries mentioned or affected by that article? Yes I have. As I stated earlier, I have given my Tipping Point talk to groups of doctors, hospitals, insurers, as well as Pharmacy Benefit Managers and groups funded by the National Institutes of Health. More specifically, I have on several occasions over the past four years given paid speeches on the Tipping Point to pharmaceutical companies. So did that create a bias in favor of the pharmaceutical industry?" —From a 2004 disclosure statement issued on Gladwell's personal website after his New Yorker article, which defended the high cost of prescription drug, caused a minor controversy and raised concerns about his financial conflicts of interests. "...[I]t is clear that an end to smoking will produce an enormous increase in the financial obligations of the federal government." Malcolm Gladwell began as a college right-wing Reagan supporter, was trained by the tobacco-funded far-right National Journalism Center, and throughout his career has inserted pro-tobacco, pro-banking industry and pro-PHARMA messages into his books and articles. Gladwell can earn $1 million a year as a paid corporate speaker, sometimes from the very same corporations and industry groups he happens to promote and defend in print. 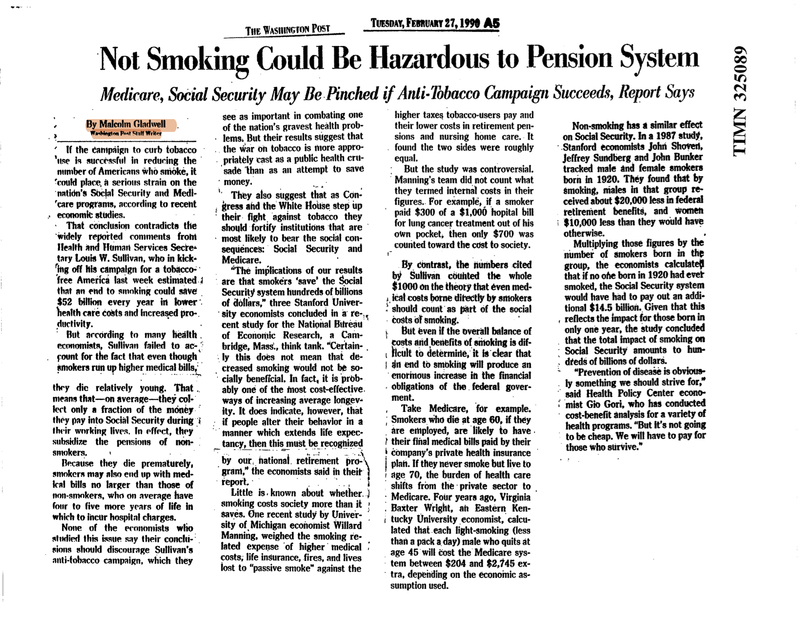 In 1990, a Gladwell article in the Washington Post warned that laws banning cigarettes could “put a serious strain on the nation’s Social Security and Medicare programs.” For evidence, Gladwell cited an old “study” churned out by a thinktank with known connections to Big Tobacco. In 2004, Gladwell was forced to end a business partnership he had formed with a market research company after David Carr of the New York Timesexposed the relationship and criticized "Mr. Gladwell's dual career as both a marketer and a writer . . ."
In 2005, Gladwell was paid to speak at a Philip Morris recruitment event. The company described the gig in its "highly confidential" 2005 performance summary: "Our efforts to develop world-class leaders remain a priority. PM USA continued to enhance its leadership development efforts by introducing new sales training programs, increasing the number of employees who have facilitated and attended our leadership development programs and revamping our recruiting efforts. . . . The program was attended by members of PM USA's senior leadership team and included an overview of PM USA, our Mission and core strategies, a tour of the factory, a lecture by best-selling author Malcolm Gladwell and two evening dinner receptions. Based on formal evaluation surveys and subsequent discussions and communications with the attendees, the event was very well perceived and rated by the attendees and is having a positive impact on our ongoing recruiting efforts." In an email exchange with S.H.A.M.E. Gladwell would not directly admit that he spoke at a Philip Morris event, and instead referred to Philip Morris as "a company with an interest in the tobacco business." Which is a funny way of putting it, considering that Philip Morris is the biggest tobacco company in the world, and maker of Marlboro, the best-selling cigarette brand of all time. In 2007, Gladwell took up the financial industry’s cause. He argued that Enron’s investors were to blame for their losses, rather than accounting fraud, which he dismissed. His "analysis" was debunked and mocked by U.C. Berkeley Economics Professor Brad DeLong. That same year, 2007, Gladwell hailed ex-Goldman Sachs CEO Hank Paulson’s move to head the Treasury Department, praising him for being among those “self-selected toward public service. . . ” Gladwell did not mention that Paulson saved himself roughly $100 million in taxes by moving straight from Goldman Sachs to Treasury. In 2011, Bank of America hired Malcolm Gladwell to take part in a multi-city speaking tour, a gig whose "entire point seemed to be to forge a public link between a tarnished brand (the bank), and a winning one (a journalist often described in profiles as the epitome of cool)," according to the Columbia Journalism Review. Washington Post’s Melissa Bell wondered: “Malcolm Gladwell: Bank of America’s new spokesman?" Be sure to check out S.H.A.M.E. 's in-depth ebook investigation into the life and corruption of Malcolm Gladwell.